Before I get into this post, I wanted to thank all of you who participated in the survey. You were able to confirm for me some things I had been thinking in my head and also gave me insights into things I didn't know. I'll be sharing the results of the survey with you soon and I'll be making a few changes around here based on your input. Thanks again! At the core of it, that's really our philosophy around here. We are a couple who think about things, plan things, analyzes things. We research and consider options. And when we execute, we take time and care. We relish in the tiny details... because when you sum up all those little bits and pieces, you end up with something unexpected, uniquely yours, and memorable. The details make all the difference. I was reminded of that when I recently stenciled Chloe's playhouse under the stairs. I had never stenciled before and thought it would be so easy and quick. Well, it was fairly easy but in no way was it quick. This little room? It took me about 12 hours to do. That's 12 hours crammed in a narrow space barely 4.5' tall. I was barely a quarter of the way finished when I wondered if I should just stop and cut my losses. I could just paint over it and buy some vintage wallpaper on Etsy. That would be a more expensive option but also quicker and easier and likely end with more dramatic results. But I decided to plod on. As I worked on the little room, Chloe would be playing in the basement and she would occasionally come over and say "That looks so pretty Mommy! I love it". It was just the encouragement I needed to keep going. And, finally, at the very end of it, I was happy. I was happy that the pattern turned out more muted than I thought it would be initially. 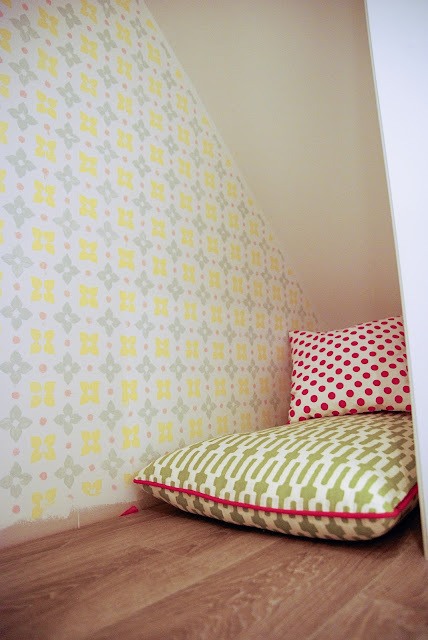 I was happy that the leftover paint colours I used worked with the cushion and pillow fabrics. I was happy with the imperfections which make the nook that much more charming. And when I led Chloe eyes-closed to this little room which I had styled with a few pillows and a blanket and her favourite stuffed cow, and she squealed and lay down and pretended to sleep, I was the happiest ever. "That took a long time, Mommy", she said. Yes it did. But I'll bet this little room and its wonky stencil and laminate floor and green and pink pillows will stay in Chloe's childhood memories even longer. The details matter. I LOVE that wallpaper in your entry! Thanks, but it's actually a stencil. No way!! You Painted that?? The details do matter and you're exactly right about Chloe's memories of that little nook lasting long into adulthood. So great that you persevered! And good to hear that you're still in love with it a year later. There are so many things in my house I wonder why I bought in the first place but I'm sure this stencil is not something I will tire of so easily either. 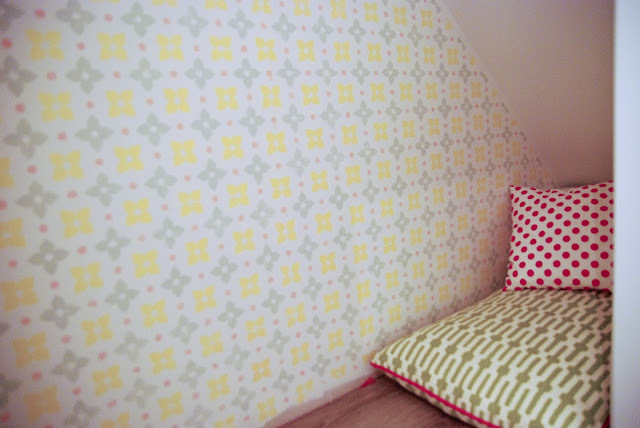 This is the first time I've visited your blog, and I love your stenciling job....I (all 6' of me) want to hang out in there - it's such a happy space! I certainly agree with you about details - when we sold our house about 2 years ago, our agent told me to depersonalize our house some, but I fought him on it. The big-ticket things (kitchens and baths, flooring) were neutral, but I painted a little sun room bright pink and painted a little quote on the wall. I painted our dining table a peacock blue, and the nursery a bright aqua. I think it's those little touches made our house stand out against the plethora of options available to buyers at that time. We sold and closed within 2 months. Something like your playhouse could be the thing that would sell a house. ( I was an agent before babies, and it was crazy sometimes the things that convinced people to buy a certain house). Thanks for your very sweet comment Erin! 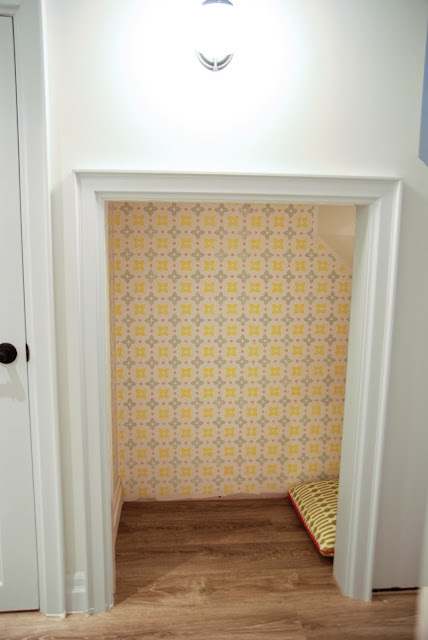 I like to think that, when Chloe's all grown up and we've converted this little nook back into storage, that some future homeowner will discover it and it will bring some magic to some other little girl and boy too. 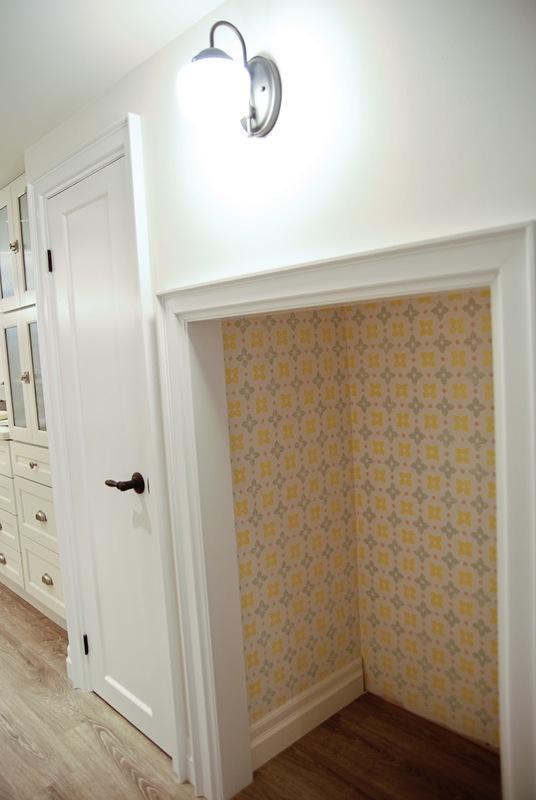 This is the sweetest little nook ever. Made even more special by your dedication. Little Chloe is going to appreciate your hard work long after she outgrows the space. Chloe is a lucky girl! It is so nice that she gave you encouragement! I'm sure she will spend lots of time in there. I agree it is hard when you are in a tedious project to see the end and keep going, but fortunately you will now have years to enjoy it! Oh, Jen! Your hard work definitely paid off, it looks absolutely amazing! OMG I love it!! so adorable and I totally can live with it myself! It is all worth the extra effort Jen! and I am 100% sure you will finish putting up the baseboard (I see the mitered edge)...but, Ha ha! I got some jollies out of that tiny unfinished detail in this post! Vintage wall paper would never give you the same level of satisfaction as this tri colour stencil! Way to go mama!! The pillows look great too!!! I love the stenciling - it looks so fresh and so pretty. It turned out so cute! I love it! That last paragraph gave me goosebumps. What a great perspective! I think you've got that expression right :) That floor pillow - such sink-into-it-goodness - is her absolute favourite spot for reading books. So pretty! A perfect nook! 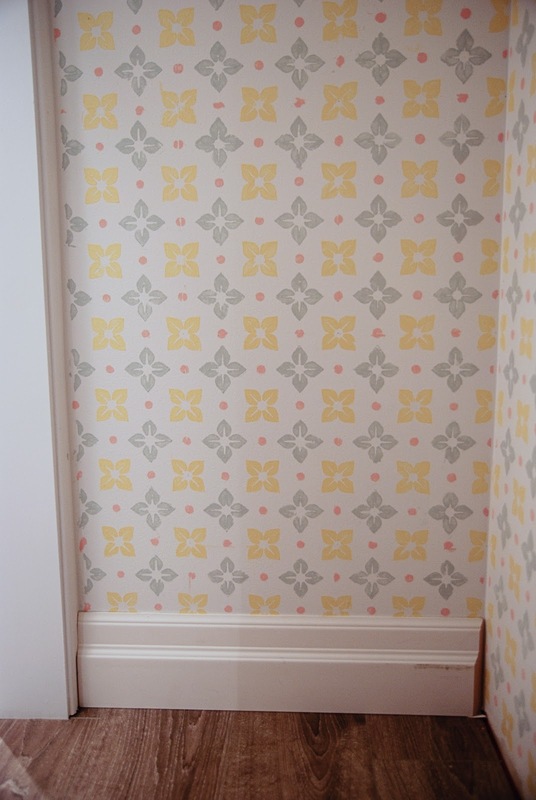 I have a stencil that I want to try out on my powder room, now you have me worried! It's adorable! You did a fantastic job. When she grows up she might not remember whether the stencil was perfect, but she will remember that you did something so thoughtful and loving for her. Cute. But She needs a carpet... Or, a fitted flat cushion for the entire footprint. - Is that section of floor heated? BTW, great job on the stencils! It is STUNNING! Love it! Jen, it's just beautiful and unique! Amazing mix of colours! It is amazing! So sweet and perfect for your daughter! Your effort definitely didn't go to waste Jen! All the colors and patterns are fabulous together! Oh Heaven's that is so sweet and adorable , the results of your efforts are amazing.